Well, I see my faithful audience has finished all their scarves. I love that one...points to a neon-orange number decorated with lime-green pom poms. So, as soon as you finish admiring this shawl, you can all go home and get a hot meal. Sorry about the pretzels. I bought them from Skinflint Airways and they assured me that the packages could be opened with the appropriate sharp cutting tool. I guess they lied, huh? But look on the bright side! I'll bet you never had pretzels fresh from a laser cutting torch before. I was going to show you a sweater (Old Town), but I still haven't gotten around to photographing it yet. 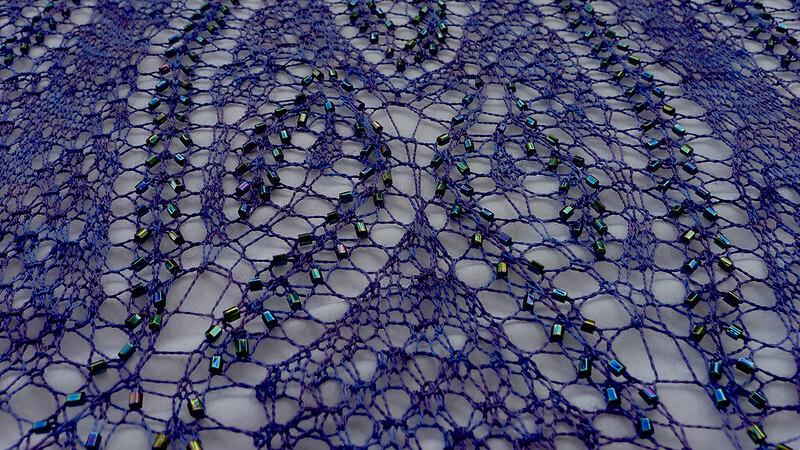 In the meantime, I finished my second rendition of Melissa Simmons's ethereal Nouveau Beaded Capelet. I cannot praise this pattern enough. Aside from the impeccable charts and written instructions, the pattern is truly original. You start by individually knitting the seven scallops, then joining them for the shawl body. 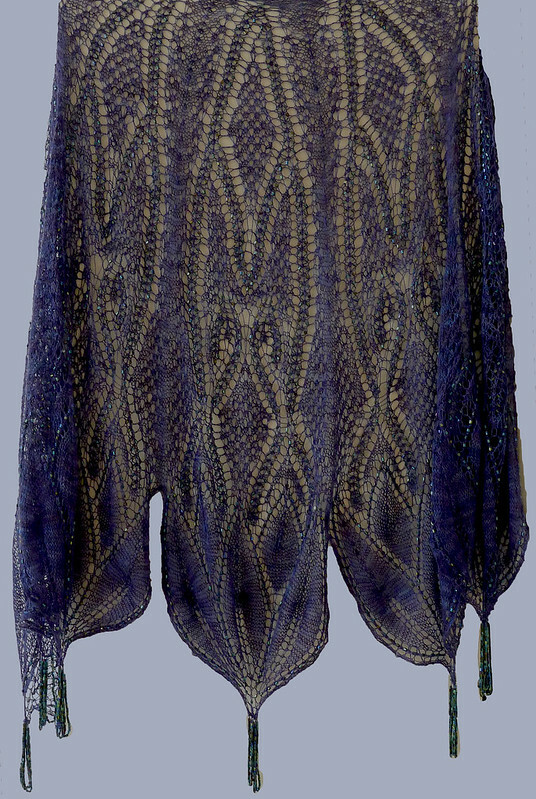 Most delightfully, the shawl narrows to the neckline, so as you get tired of it, the rows become shorter and shorter. On the down side, you need 6000 beads. 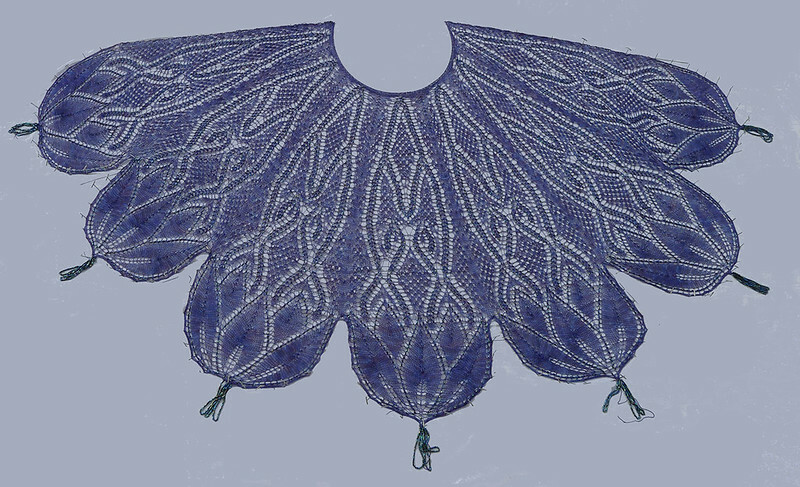 The first time I knit the capelet, it took me two months. 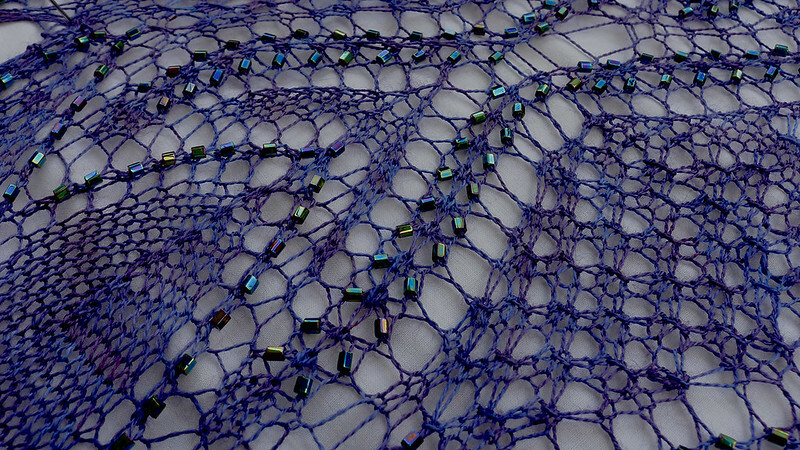 Thanks to my wonderful Fleegle Beader, I completed the second one in three weeks.The shawl was knit with my very own AK47 silk in a pretty dark blue and purple color. One of the advantages of owning a little lace knitting store is the abundance of goodies in the cellar, heh heh. Because 6000 #8 beads weighs about four ounces, the shawl drapes beautifully and stays in place on your shoulders. 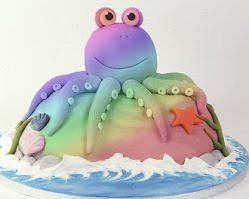 It also produces charming clicky noises when you move around. The beads themselves are from The Land of Odds 8c-455 cut--an iridescent purple/blue/green/gold color that shimmers in even the faintest light. So, Okay. You guys can go home now. Unlocks auditorium doors....Don't forget your scarves, and feel free to take as many bags of roasted pretzels as you wish! Come back soon!